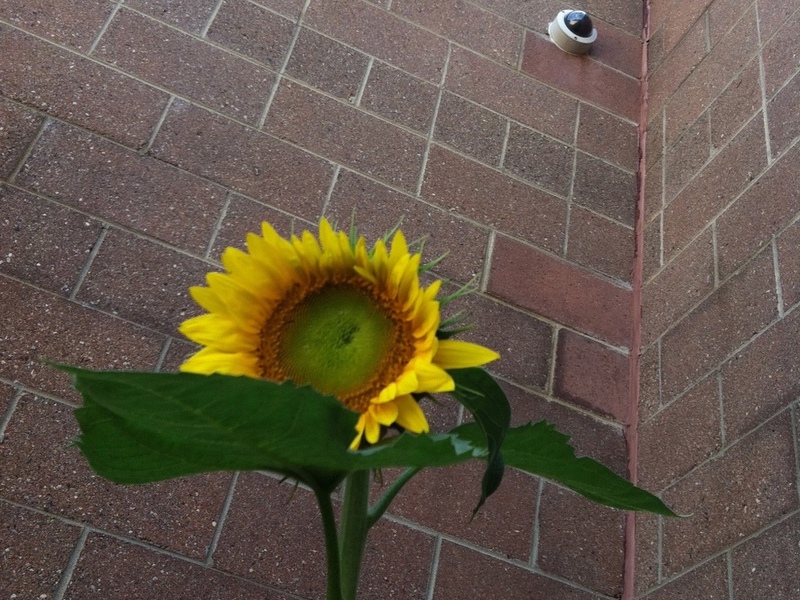 Newsletter Spotlight Summer 2015 — Michigan Master Gardener Association, Inc.
Washtenaw Master Gardeners have an award- garnering project with the Washtenaw County Juvenile Detention Center. For the past four years, a group of seven Master Gardeners have worked with and guided incarcerated at-risk high school age students to garden in two enclosed courtyards, an entrance garden, and a Serenity Garden. These high school students do the planting, tending, harvesting, and cooking in the four gardens with MG instruction. Master Gardeners garden with the students one morning a week from April through October. Four adult volunteers are paired with at least two staff members for the five to ten youth in the classes. Educational objectives include: allowing students to see where their food comes from; explaining nutritional importance of fresh produce; showing how to raise plants organically without chemicals; teaching students about sustainable living and the value of local food sources; learning about the importance of native plants; giving students the chance to feel pride in their garden work; and learning to work cooperatively with other kids and adults. 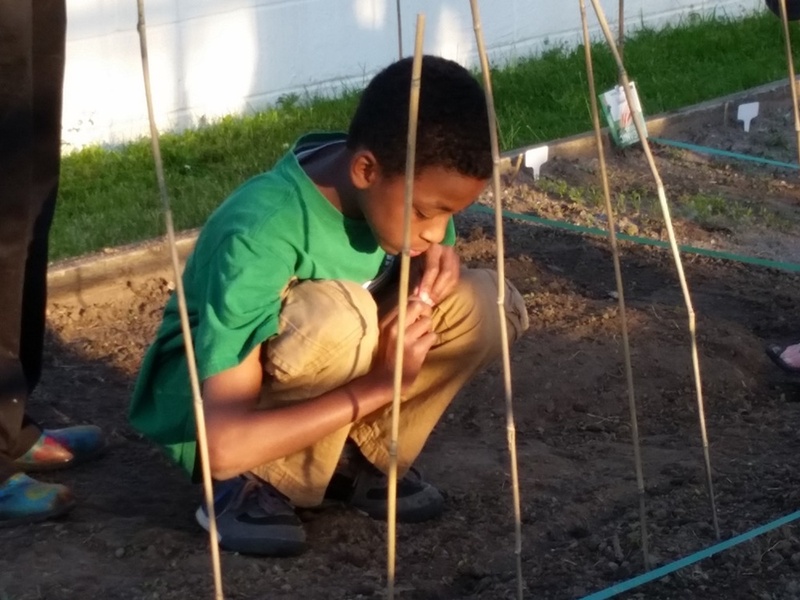 For many of the youth, this project is their first gardening experience. For others, it is an opportunity to recall good memories from childhood gardening with a parent or grandparent. For all, whether rediscovering a prior positive experience or being exposed to a totally foreign experience, the gardening project helps raise self-esteem. The kids see plants they have never heard of before, learn how to care for them, and try new recipes. 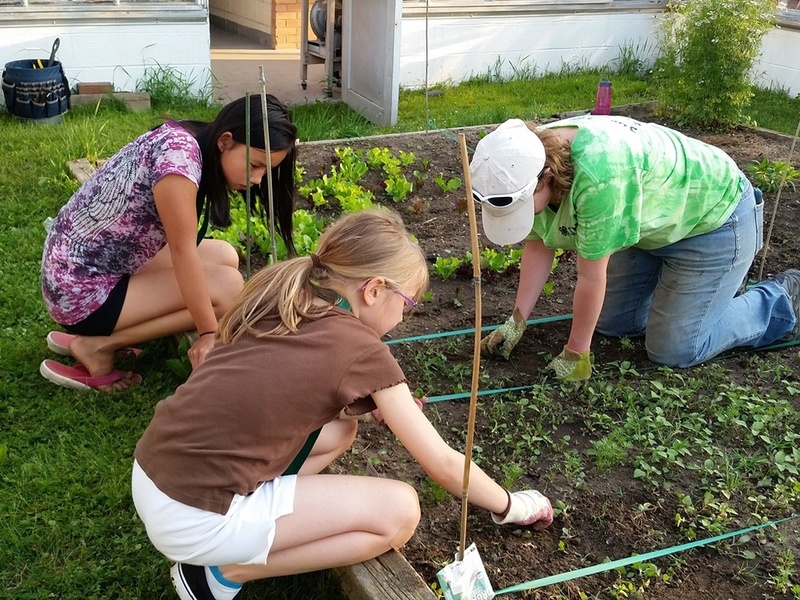 Started in 1994 and rejuvenated in 2001, more than 150 9- to 11-year-olds have participated in the Junior Master Gardener program through Washtenaw County 4-H. This year, Master Gardeners Anne Fisher, Judi Graber, Juli Mueller, and Tom Shope spent the winter revising the curriculum. In May, a new cohort of students began the Junior Master Gardener program. A group of several leaders, coordinated by Anne Fischer (MG 2004), runs the program with help from a team of Master Gardener volunteers. These volunteers guide students through six weeks of learning many of the same topics taught in the adult Master Gardener course. They then put that knowledge to work, planting, maintaining, and harvesting a 1200 square foot vegetable garden throughout the summer. 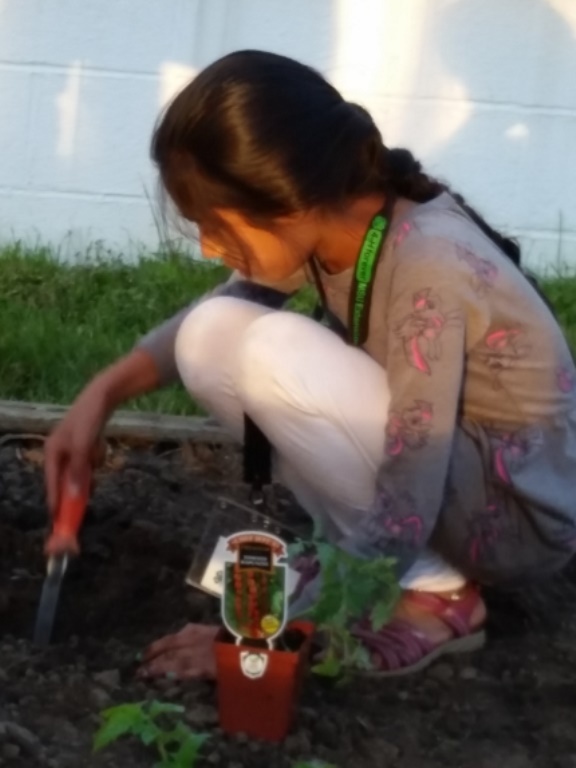 The youth who participate in the Junior Master Gardener program come from a variety of backgrounds, but, as one child explained, they all share an interest in "learning how to make stuff grow." Each week, the class meets for two hours at Matthaei Botanical Gardens in Ann Arbor. The first part of class is spent learning about topics such as soil, plant parts, or integrated pest management. Master Gardener volunteers take turns leading the students through activities related to each topic. One week, the students might run water through different types of soil to learn about soil texture and water retention. The next week, students might dissect a seedling to learn how plants grow or play a jeopardy game to practice identifying vegetables. Most weeks, students also spend time working in the vegetable garden. In the garden, Master Gardener volunteers help students plant lettuce and other cool-weather vegetables the first day of class. 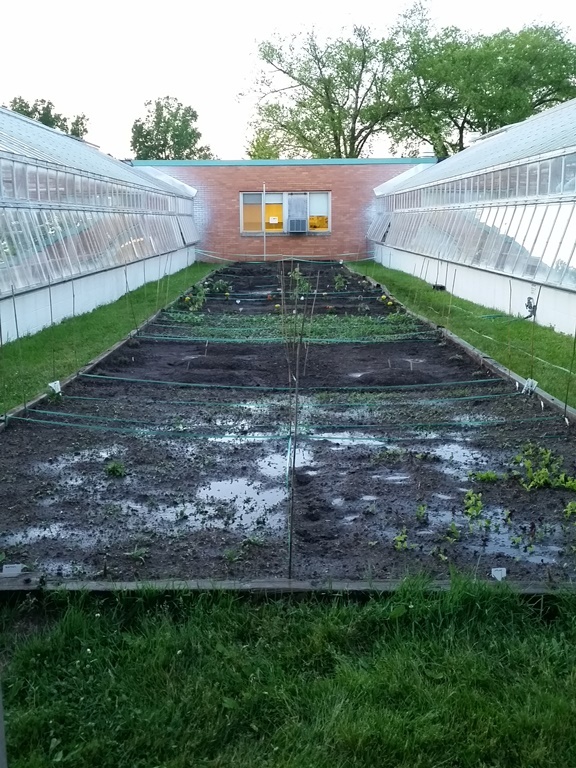 Two weeks later, the students plant the rest of the garden with vegetables ranging from the traditional (tomatoes, cucumbers, etc.) to the more unique (kohlrabi, parsnips, etc.). At the end of the six week classroom portion of the program, the students harvest the lettuce and invite their families for a salad party. This year, there were almost 40 family members in attendance, and there was more than enough lettuce, kale, and radishes to go around! After the salad party, students return to the garden every other week throughout the summer to keep on top of the weeds and harvest vegetables as they mature. Master Gardener volunteers are always on hand to answer questions, point out things of interest, and work side-by-side with the students as they learn to distinguish weeds from planted veggies. Students who start the program proclaiming "I hate all vegetables!" often find themselves nibbling on crisp green beans and juicy cherry tomatoes. Parents look on, amazed, as their child tastes an herb for the first time or excitedly digs up some carrots to bring home for a snack. In September, the students spend the final work session harvesting the last of the vegetables and cleaning up the garden, followed by a harvest party with their families. Students who have successfully completed the classes and at least 10 hours of work in the garden proudly receive their Junior Master Gardener certificates (often while munching on the fruits of their labor)! *Have an idea for our Spotlight section? Click here to let us know!